How do I superimpose a photo on another one? There are many tools to combine images and many ways. 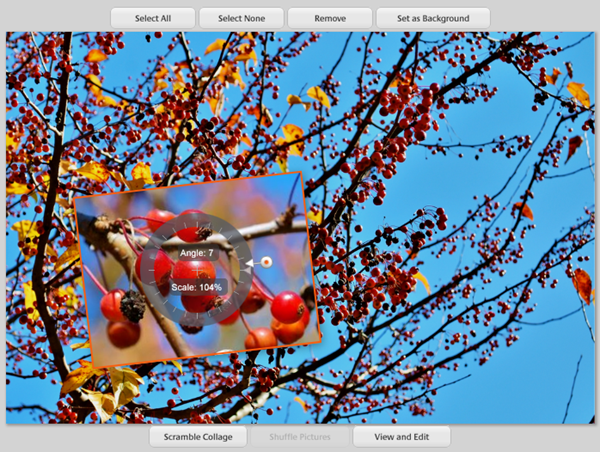 For adding, superimposing, one photo over another, a quick and easy method is to use the collage tool in Picasa. Here is an example: I have a photo of a tree covered in fruit. It is hard to discern the detail so I want to superimpose a close-up. 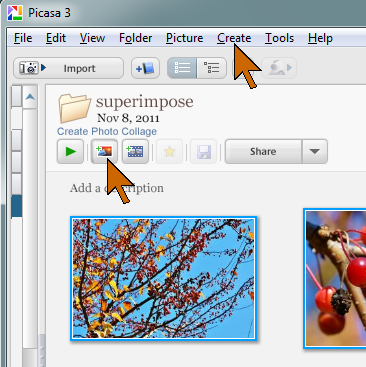 Picasa has a “Create Photo Collage” tool right under the folder name in Library view. 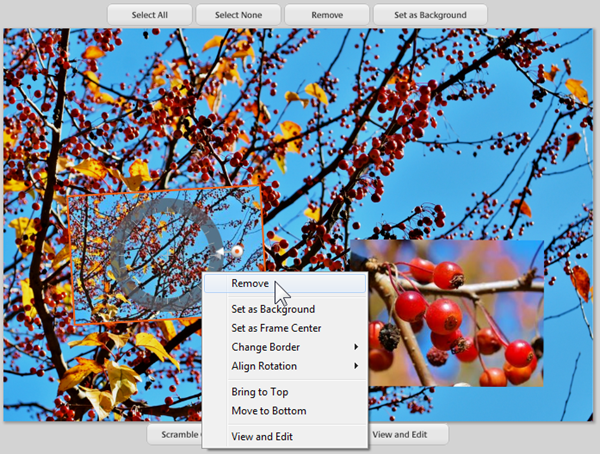 The tool can also be launched from the Create menu where it is called “Picture collage …”. If you click the button, all of the photos in the folder will be loaded. If you want just some of the pictures select them (Ctrl+click) before launching the collage tool. To use one photo as the base and to superimpose one or more others, first set the aspect ratio of the collage. My camera produces images in the 35mm camera aspect ratio of 1 to 1.5, so I select the “4 x 6: Small print” setting. This way the base picture will not get cropped. 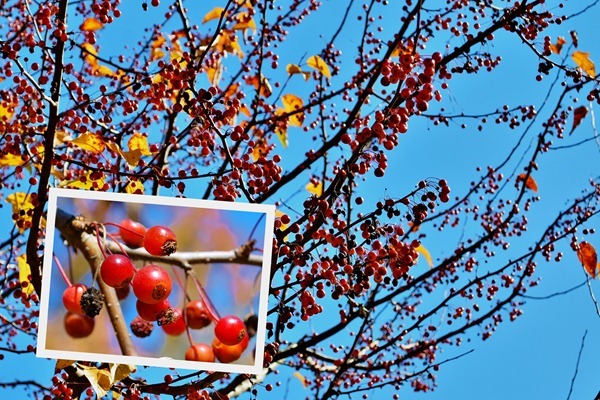 The “Picture Borders” setting allows putting a border on each of the superposed images. Click on the image to use as the base to select it, then under “Background Options” click “Use Image”. The base photo will now fill the collage area and all selected photos will be superimposed. Since the small version of the base image is not needed, right-click it and select Remove. This will leave just the image or images that should be placed on the base photo. In the example here there is just one. It can be dragged to the desired position. Click on the insert image and a four-pointed arrow shape pointer tells that the image can be dragged for positioning. Move the pointer toward the center and a control ring and control handle – a little bulls-eye button – is displayed. drag the control handle sideways and the image is made larger (to right) or smaller (to left). Move it up or down and the image is rotated. Really, this operation is faster than you can read about it. In no time at all, you can place the insert photo or photos just the way you want – in size, position, and rotation. 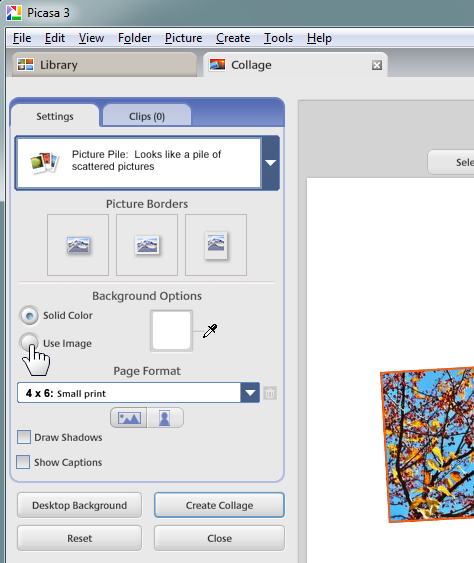 To finish, click “Create Collage” in the controls pane. The collage image will be created and saved. The default file location is in Pictures – Picasa – Collages. The finished collage will likely be much larger than the original image, so you may wish to resize it. This entry was posted in General by Ludwig. Bookmark the permalink.